Design Your Own Callaway EPIC Flash and APEX 19 Complete Golf Set and Save! This packages combines Callaway's EPIC Flash driver and fairway woods with with the new APEX 19 iron set. A lethal combination of the fastest clubface ever on the woods and the ultimate forged players distance irons! 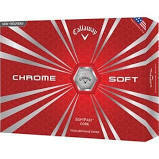 Purchase this set now and receive a free dozen Callaway Chrome Soft Golf Balls. The new Epic Flash driver features Callaway’s new Flash Face and several additional performance technologies to make this the ultimate combination of low-spin and high MOI in a driver. The new Epic Flash fairway wood employs a new Callaway technology called Flash Face to help golfers get more ball speed for more distance. Flash Face incorporates an entirely new method of architecture to give golfers a remarkably hot face that delivers a boost in distance-enhancing ball speed in the face’s center-region. Developed with the help of Artificial Intelligence and Machine Learning, the Flash Face design is a drastic departure from any previous Callaway face technology. Two adjustable sole weights allow for specialized launch, spin and trajectory. Position the 16g weight forward for penetrating, low-spinning flight; position the 16g weight back for high, long-carrying flight.